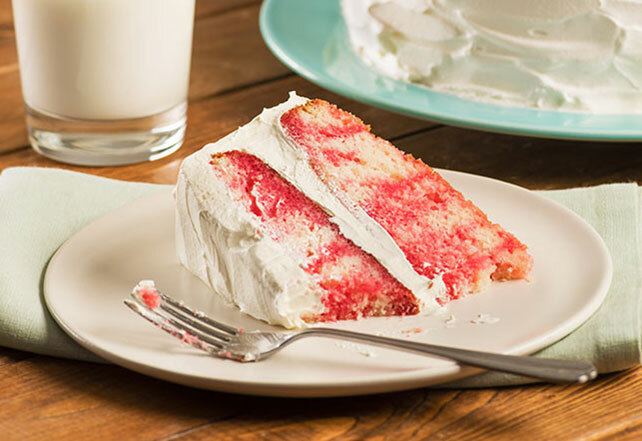 Make scrumptious JELL-O Strawberry Poke Cake for a sweet treat! Just add some whipped topping on top of the strawberry poke cake, and it's ready to serve. Dip bottoms of cake pans in warm water 10 sec. ; unmold cakes. Fill and frost cake layers with COOL WHIP. Refrigerate 1 hour. Enjoy a serving of this easy-to-make poke cake on occasion, but keep portion size in mind. One cake makes enough for 16 servings. For colored frosting, gently stir a few drops food coloring into the COOL WHIP before using as directed.